Busbud is already essentially the biggest bus marketplace in the world, and with this critical mass and new capital, they’re poised to be the leading ticketing partner for bus operators and favorite booking experience for smart travelers. 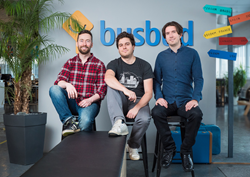 Busbud, the online marketplace that enables global travelers to shop for and book intercity bus tickets on over 1.4 million bus routes worldwide, today announced the close of US$11 million in series B funding (approximately CAD$14 million). The round is led by iNovia Capital and includes new investors Teralys, Claridge and Plaza Ventures, as well as Real Ventures. The capital will be used to fuel technology development, further grow the team and accelerate geographic expansion. The trio of iNovia, Claridge and Teralys, who had previously teamed up to back Luxury Retreats, a high-end vacation rental marketplace that was acquired by Airbnb in February 2017, are reuniting for Busbud’s B-Round. Joe Poulin, founder and CEO of Luxury Retreats, and Peter Kern, director of Expedia and Managing Partner of InterMedia Partners, were also angel investors in Busbud. The round also includes funds from new investors Erik Blachford, former CEO of Expedia, and Philippe Vimard, former CTO/COO of publicly-listed eDreams/ODIGEO Travel Group and current CTO of Doctolib, the No. 1 booking platform for doctors in Europe. Both are joining Busbud’s board of directors, bringing their vast experience in travel and technology to the company. Magaly Charbonneau, Principal at iNovia, will also be joining the board. Magaly is a seasoned tech entrepreneur with several successful exits including PasswordBox, acquired by Intel Corporation in 2014. Busbud is an online marketplace that enables global travelers to shop for and book intercity bus tickets on over 1.4 million bus routes worldwide. Available in 11 languages, the company’s convenient and secure booking website and app offer the ability to search, compare and buy tickets from over 1,300 bus companies in 16,000 cities across 75+ countries, supporting transactions in 30 currencies. Co-founded in 2011 by longtime friends LP Maurice (CEO), Michael Gradek (CTO) and Frédéric Thouin (Chief Product Officer). The company currently has 35 employees and is based in Montreal, Quebec. Experience travel with Busbud at http://www.busbud.com and share your adventure!